The first pictorial commemorative Romanian stamps appeared in 1903. During the ten year period from 1903 to 1913, only five different sets of commemorative stamps were issued, and three of them were issued during 1906. However each of the sets contained ten or more denominations, thus it may appear that more commemorative stamp sets were issued during this period than is actually the case. The definitive-type stamps issued in 1891 for the Silver Jubilee of King Carol I will be found in the "Definitives" page containing that year. 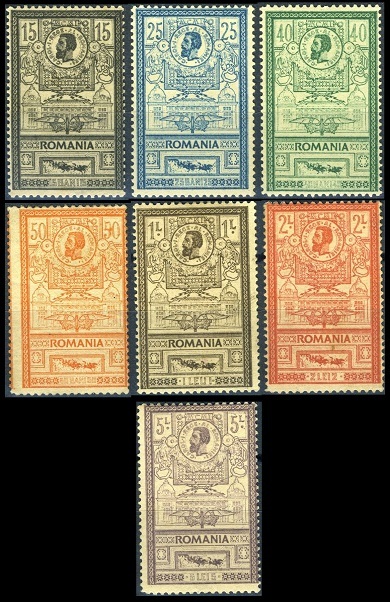 The fifteen Romanian stamps shown above (Sc. #158-172) were issued during April and May of 1903 to celebrate the Opening of the New Post Office in Bucharest. The design of the horizontally oriented stamps features a mail coach leaving a post office. The design of the vertically oriented stamps features a medallion with the portrait of King Carol I and the facade of the new post office building. Forgeries of these Romanian stamps do exist, so one should take care when buying them, especially with the higher priced denominations. 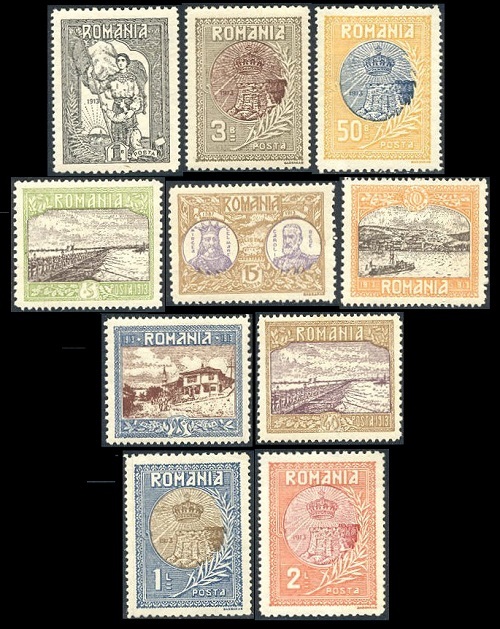 The ten Romanian stamps shown above (Sc. #176-185) were issued in July 1906 to celebrate the 40th Anniversary of the Reign of Carol I, as the Prince of the United Romanian Principalities (1866-1881) and as the King of Romania (1881-1914). 01 B. - King Carol I taking the oath of allegiance in 1866. 03 B. - Prince Carol in royal carriage. 05 B. - Prince Carol at Calafat in 1877. 10 B. - Prince Carol shaking hands with his captive, Osman Pasha. 15 B. - Carol I as prince in 1866 and as king in 1906. 25 B. - Romanian army crossing the Danube. 40 B. - Romanian troops returning to Bucharest in 1878. 50 B. - Prince Carol at the head of his command in 1877. 01 L. - King Carol I at the Curtea de Arges Cathedral in 1896. 02 L. - King Carol I at the Shrine of St. Nicholas in 1904. 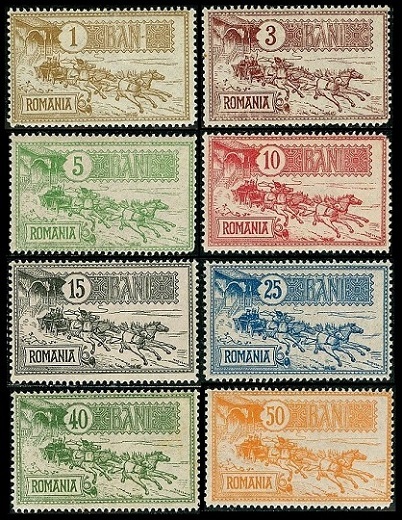 The ten Romanian stamps shown above (Sc. 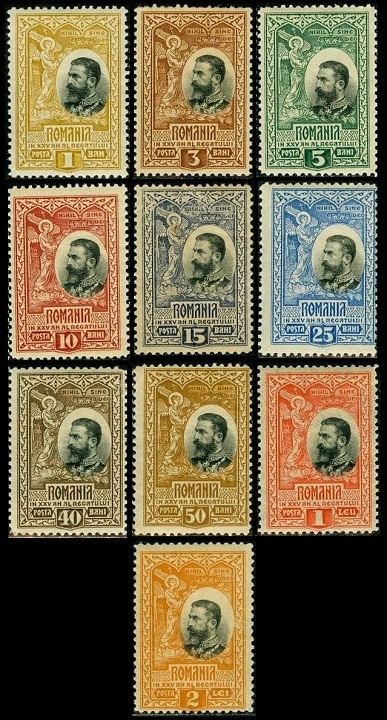 #186-195) were issued in June 1906 to celebrate the 25th Anniversary of the establishment of the Kingdom of Romania and of the Coronation of King Carol I. The Romanian General Exposition of 1906 was also called the Dacia-Romania Exhibition, the Jubilee Exhibition, and the National Exhibition. The exhibition lasted from June 6 through November 23, 1906, and it was authorized to celebrate the 40th Anniversary of the Rule of Carol I, the 25th Anniversary of the Proclamation of the Kingdom of Romania, and the 1,800th Anniversary of the Roman Emperor Trajan's Conquest of Dacia (Romania) in A.D. 106. 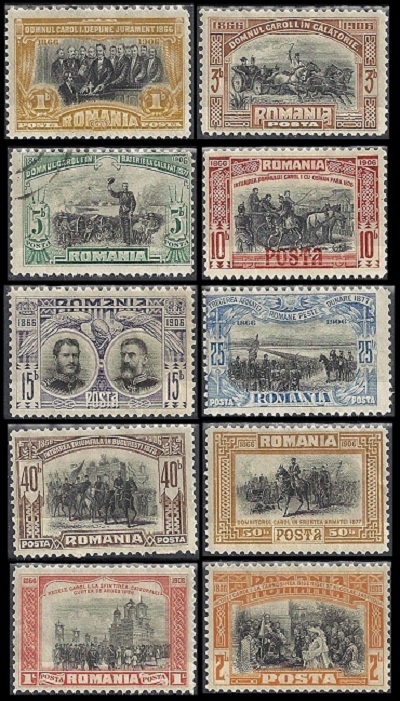 The eleven pictorial Romanian stamps shown above (Sc. #196-206) were issued to publicize the Romanian General Exposition of 1906. These stamps were sold at post offices in Romania, from July 29 to July 31, 1906, and they were only valid for postage on those three days. Thus, they are scarce. 05 B. - Plowman and angel. 10 B. - Plowman and angel. 15 B. - Exposition building. 25 B. - Exposition building. 30 B. - Exposition building. 40 B. - Exposition building. 50 B. - Exposition building. 75 B. - Exposition building. 01.50 L. - King Carol I. 02.50 L. - King Carol I. 03 L. - Queen (Consort) Elizabeth. 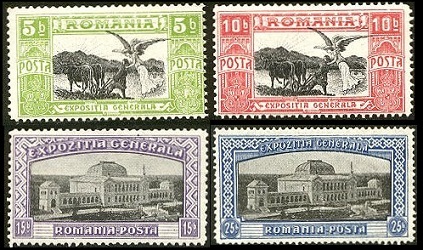 The mint and favor-canceled sets of these stamps sold at the Romanian General Exhibition were all overprinted with the letters " S E ". An example is shown above. The stamps with this overprint are very scarce, being worth more than twice the price of the regular pictorial stamps without the overprint. 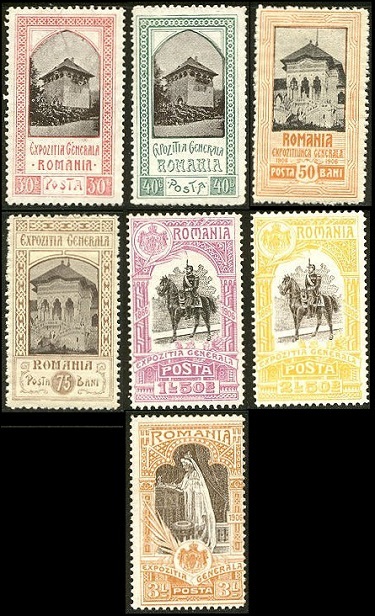 The ten Romanian stamps shown above (Sc. #230-239) were issued on December 25, 1913 to celebrate Romania's Annexation of Silistra. 01 B. - Romania holding flag. 03 B. - Romanian crown and old fort on the Danube. 05 B. - Troops crossing the Danube. 10 B. - View of Turtucaia. 15 B. - Mircea the Great and King Carol I. 25 B. - View of Silistra. 40 B. - Troops crossing the Danube. 50 B. - Romanian crown and old fort on the Danube. 01 L. - Romanian crown and old fort on the Danube. 02 L. - Romanian crown and old fort on the Danube. Silistra is a very important and strategic port city at the conjunction of the Danube River and the Black Sea. From ancient times, when it was part of Thrace, this town of a little over sixteen square miles has been one of the most hotly contested pieces of real estate in the Balkans. The Romans built a fortress there in A.D. 29, on the site of an older Thracian settlement called Durostorum. Over the centuries, this town has been fought over and occupied by the Byzantine Empire, the First Bulgarian Empire, the Second Bulgarian Empire, the Ottoman Empire, and the Russian Empire. Following the Second Balkan War in 1913, the St. Petersburg Conference awarded Silistra to the Kingdom of Romania. Bulgaria re-occupied the town during the later part of World War I, but after the war, it was returned to Romania. At the beginning of World War II, in 1940, the Treaty of Craiova returned the town to Bulgaria, and today, Silistra is still part of the Republic of Bulgaria.